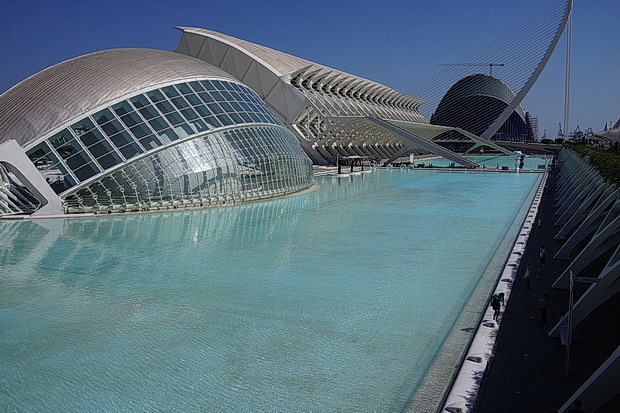 An ultra-modern scientific and cultural complex known in Spanish as la Ciudad de las Artes y las Ciencias, Valencia’s City of Arts and Sciences offers breathtaking architecture housing Europe’s largest aquarium, a science museum, IMAX cinema, planetarium, and a purpose-built opera venue. 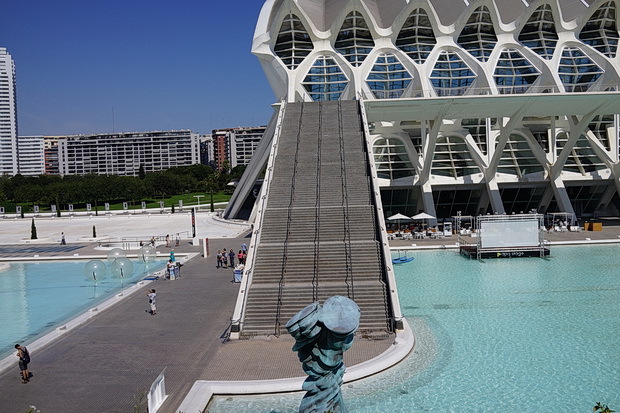 The most important modern tourist destination in the city of Valencia and one of the 12 Treasures of Spain, The City of Arts and Sciences is situated at the end of the former riverbed of the river Turia, which was drained and rerouted after a catastrophic flood in 1957. 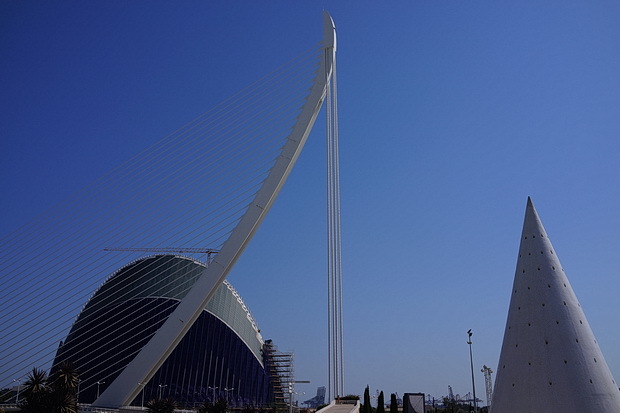 Designed by Santiago Calatrava and Félix Candela, the project began the first stages of construction in July 1996, and was inaugurated on April 16th, 1998, with the last component being inaugurated on October 9th, 2005. 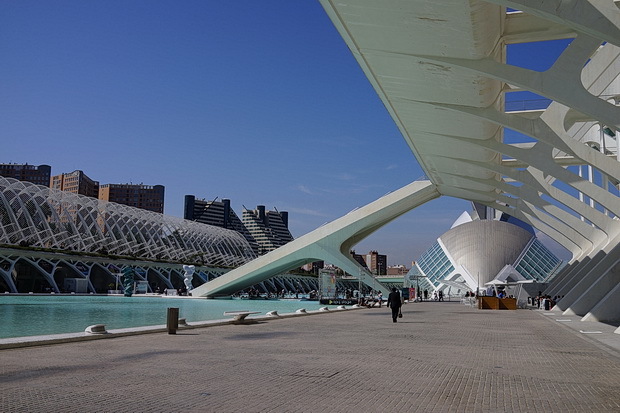 Financial woes aside, the City forms a stunning collection of buildings which the public are free to walk around (although there are admission charges to enter some of the attractions). 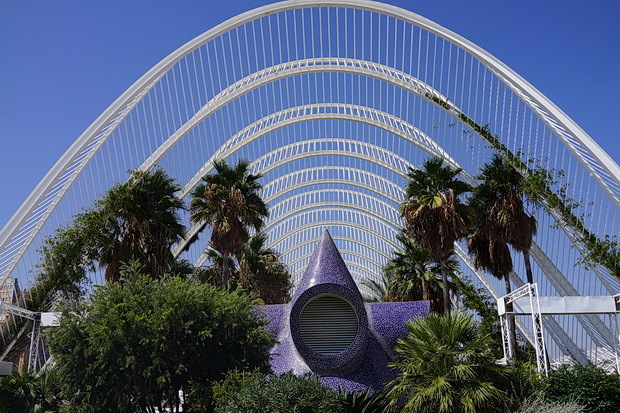 L’Umbracle (2001) — an open structure enveloping a landscaped walk with plant species indigenous to Valencia (such as rockrose, lentisca, rosemary, lavender, honeysuckle, bougainvillea, palm tree). 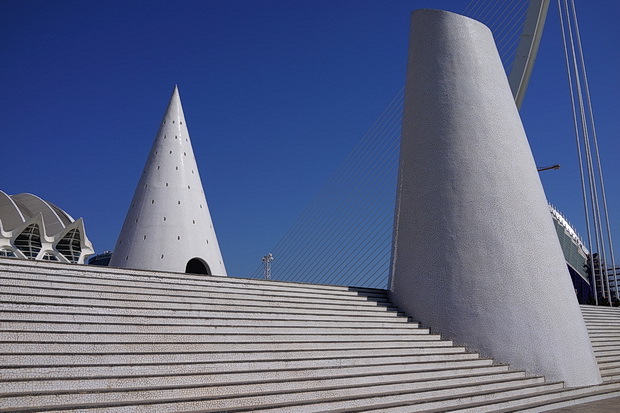 It harbours in its interior The Walk of the Sculptures, an outdoor art gallery with sculptures by contemporary artists. 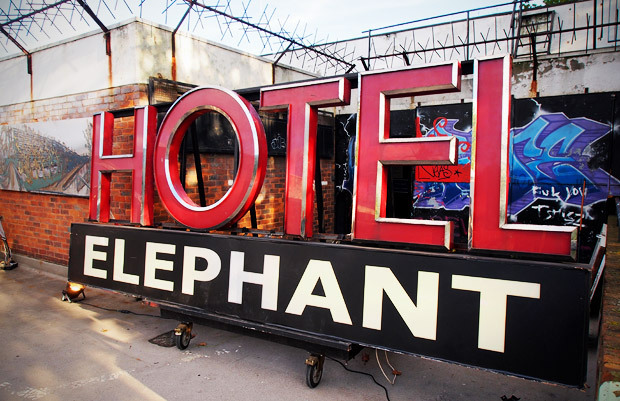 (Miquel de Navarre, Francesc Abbot, Yoko Ono and others). 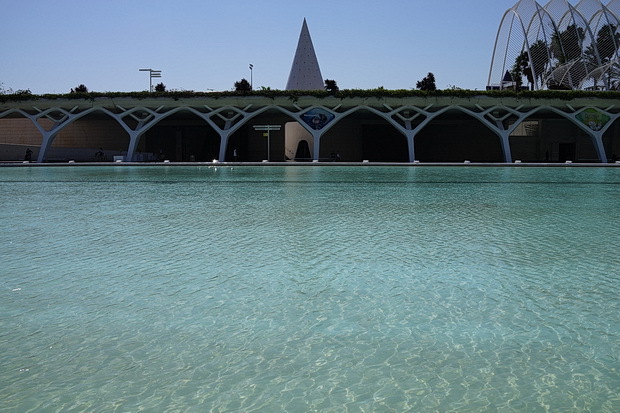 The Umbracle is also home to numerous free-standing sculptures surrounded by nature. 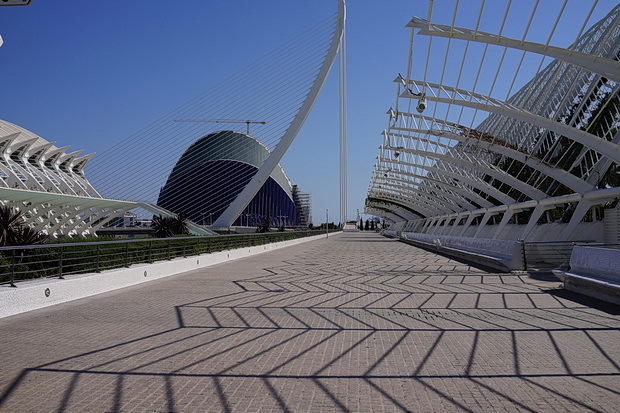 It was designed as an entrance to the City of Arts and Sciences. 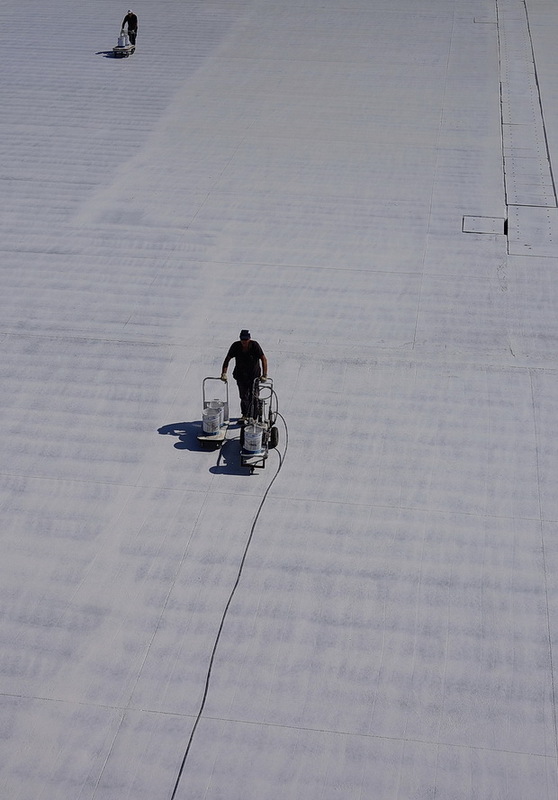 It is 320 meters long and 60 meters wide, located on the southern side of the complex. 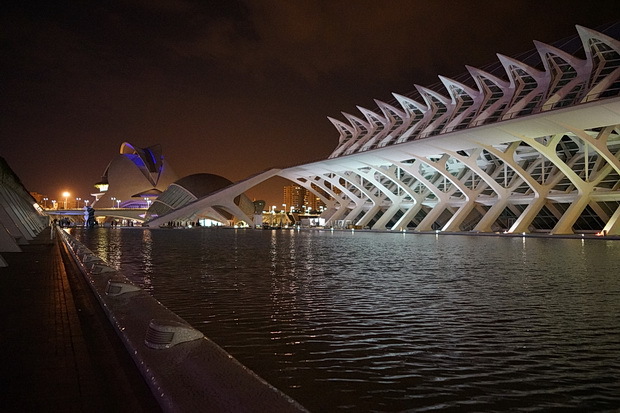 It includes 55 fixed arches and 54 floating arches that stand 18 meters high. The plants displayed were carefully picked to change colour with each season. The garden includes 99 palm trees, 78 small palm trees, 62 bitter orange trees. 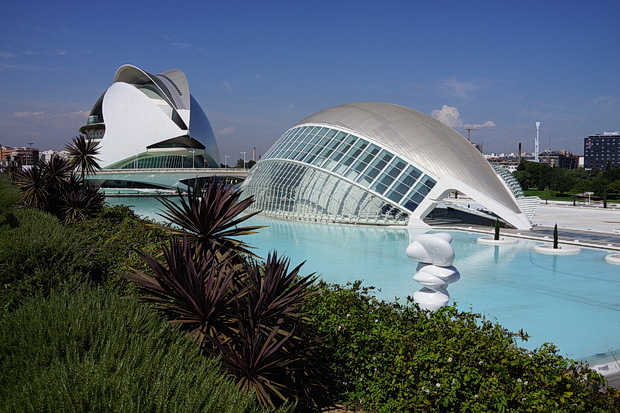 There are 42 varieties of shrubs from the Region of Valencia including Cistus, Mastic (Pistacia lentiscus), Buddleia, Pampas grass (Cortaderia), and Plumbago. In the garden there are 16 species of Mirabilis jalapa, or the four-o’clock plant (beauty of the night). Honeysuckle and hanging Bougainvillea are two of the 450 climbing plants in the L’Umbracle. There also are 5,500 ground cover plants such as Lotus, Agatea (Fellicia amelloides), Spanish Flags, and Fig Marigolds. 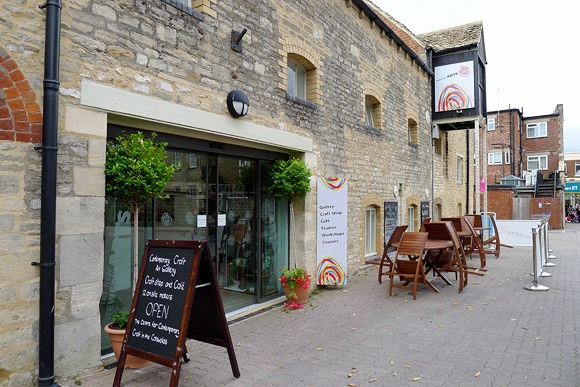 There are over a hundred aromatic plants including Rosemary and Lavender. 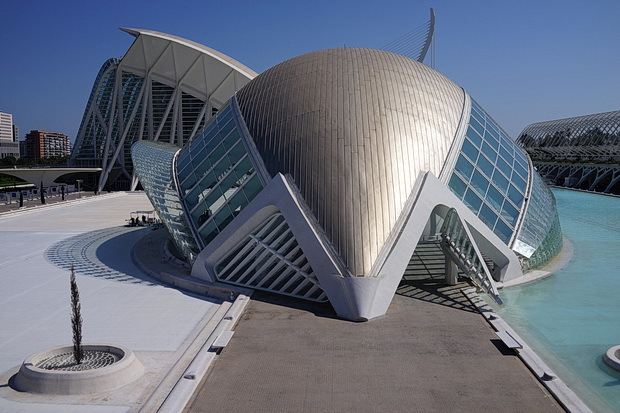 El Museu de les Ciències Príncipe Felipe (2000) — Is an interactive museum of science that resembles the skeleton of a whale. 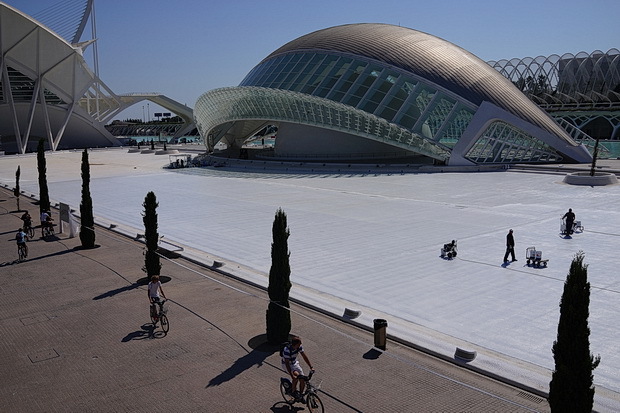 It occupies around 40,000 m² on three floors. The hotch-potch of exhibits is designed more for ‘entertainment value’ than for science education. 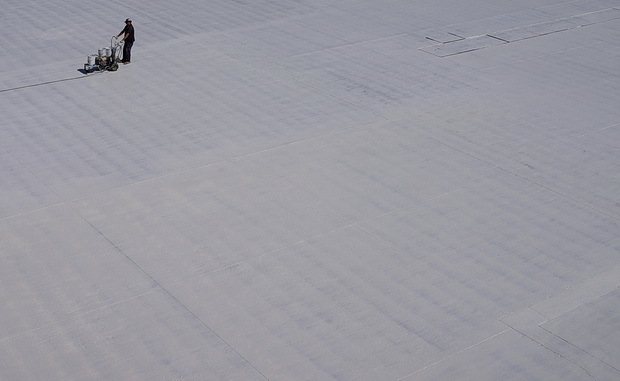 Much of the ground floor is taken up by a basketball court sponsored by a local team and various companies. 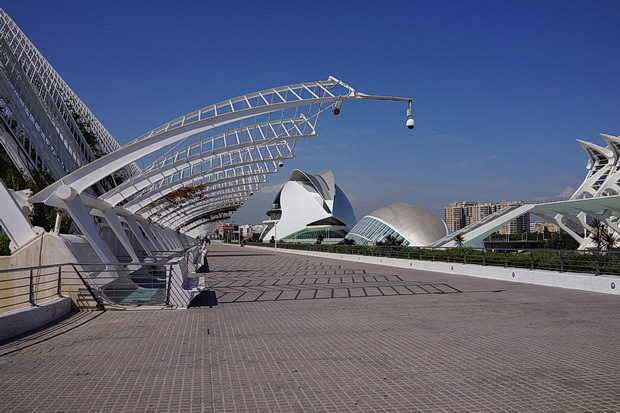 The building is made up of three floors of which 26,000 square meters is used for exhibitions. 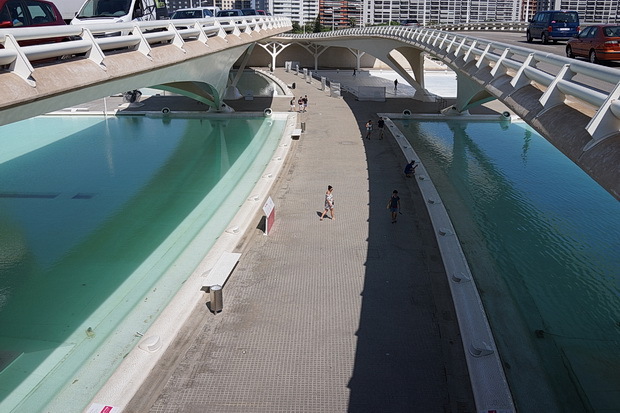 The first floor has a view of the Turia Garden that surrounds it; which is over 13,500 square meters of water. The second floor hosts “The Legacy of Science” exhibition by the researchers; Santiago Ramón y Cajal, Severo Ochoa y Jean Dausset. The third floor is known as the “Chromosome Forest” which shows the sequencing of human DNA. Also on this floor is the “Zero Gravity,” the “Space Academy,” and “Marvel Superheroes” exhibitions. 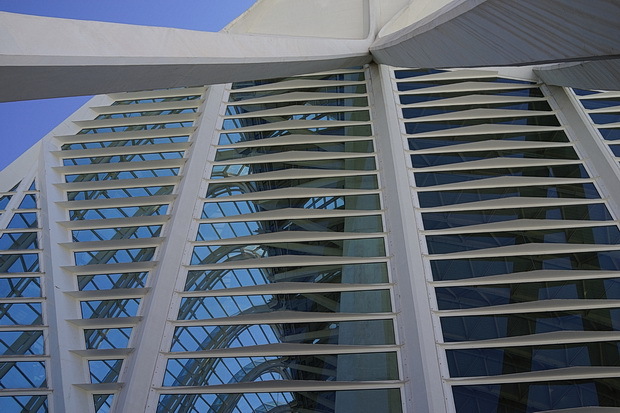 The building’s architecture is known for its geometry, structure, use of materials, and its design around nature. 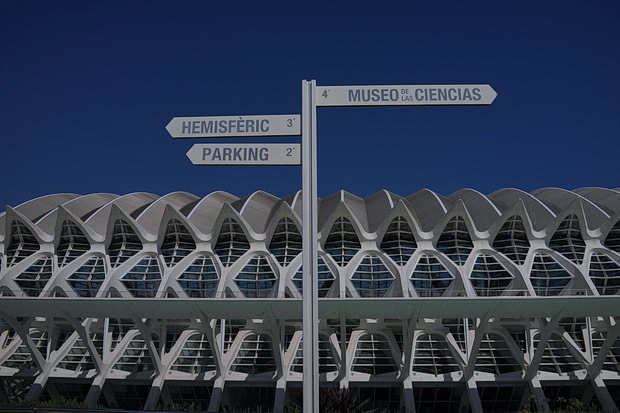 The building is about 42,000 square meter and 26,000 square meters of is exhibition space, which is currently the largest in Spain. 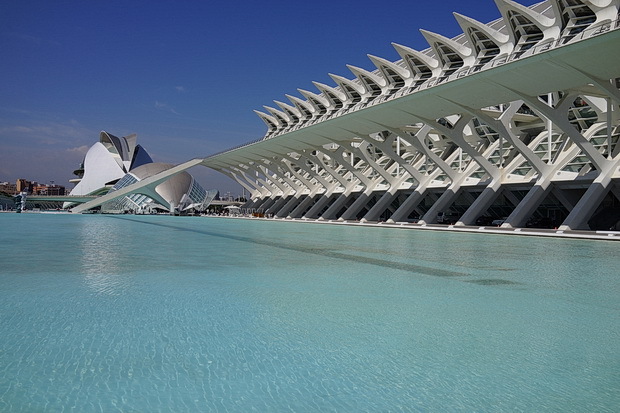 It has 20,000 square meters of glass, 4,000 panes, 58,000 m³ of concrete, and 14.000 tons of steel. 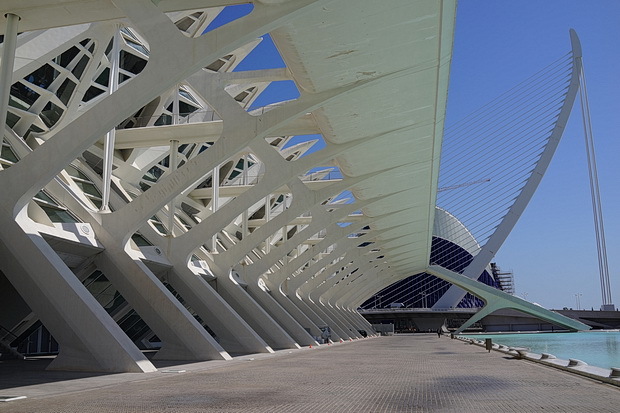 This magnificent building stands 220 meters long, 80 meters wide and 55 meters high. 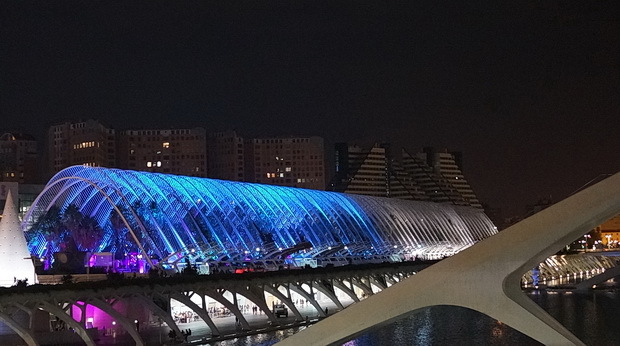 L’Hemisfèric (1998) — an IMAX Cinema, planetarium and laserium. 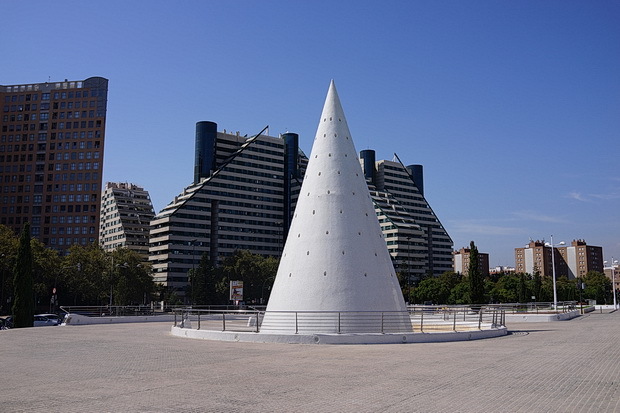 The building is meant to resemble a giant eye, and has an approximate surface of 13,000 m². 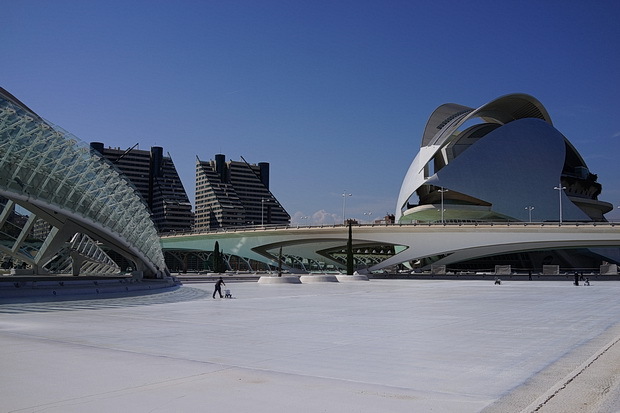 The Hemesferic also known as the planetarium or the “eye of knowledge,” is the centerpiece of the City of Arts and Sciences. 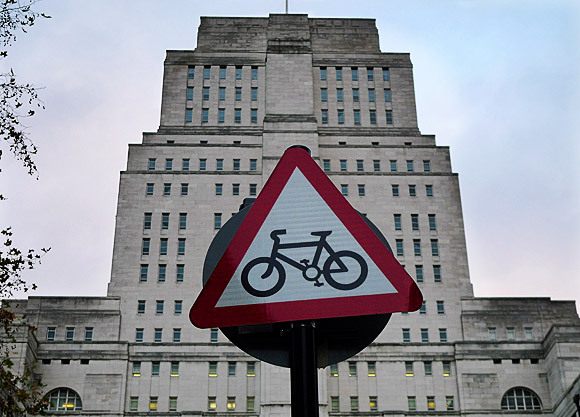 It was the first building completed in 1998. 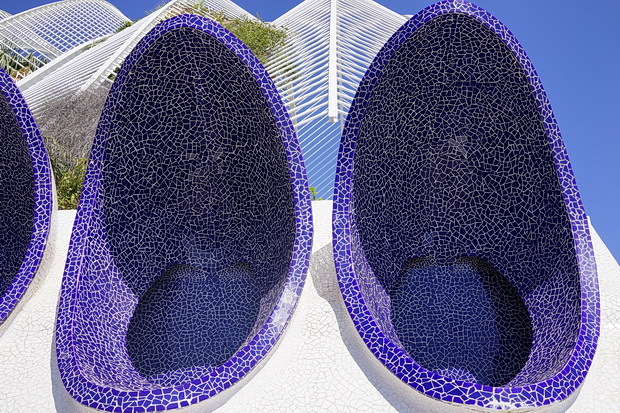 Its design resembles an eyelid that opens to access the surrounding water pool. 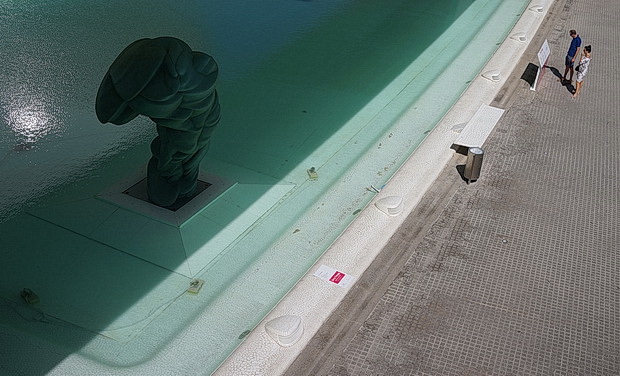 The bottom of the pool is glass, creating the illusion of the eye as a whole. 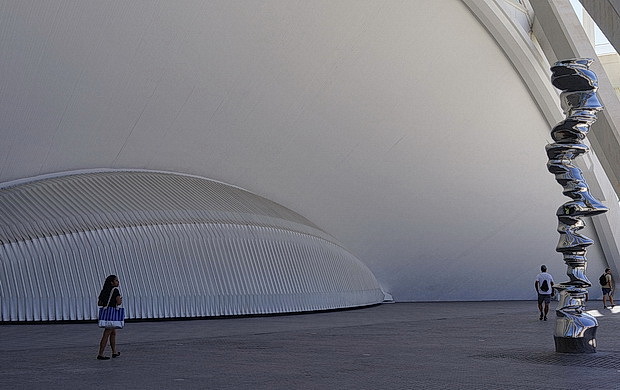 This planetarium is a half-sphere composed of concrete 110 meters long and 55.5 meters wide. 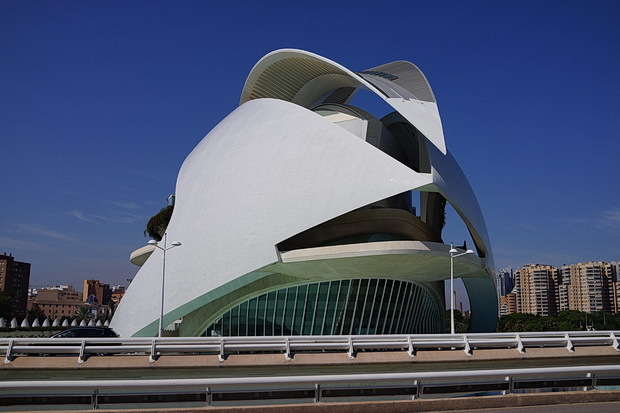 The shutter is built of elongated aluminium awnings that fold upward collectively to form a brise soleil roof that opens along the curved axis of the eye. 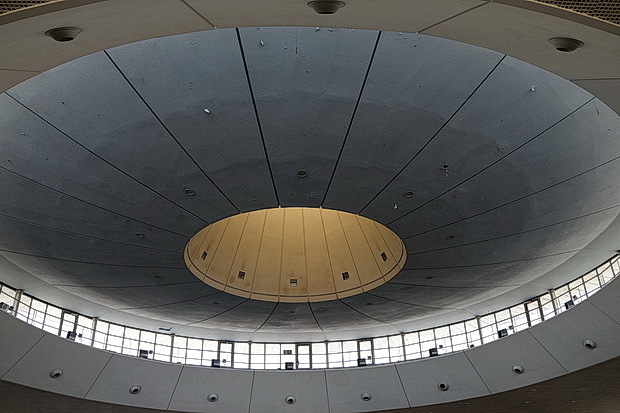 It opens to reveal the dome, the “iris” of the eye, which is the Ominax theater. 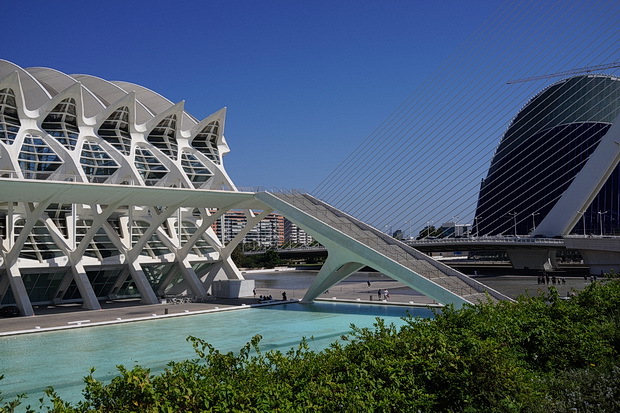 The City of Arts and Sciences is divided in half by a set of stairs that descend into the vaulted concrete lobby. The underground spaces are illuminated with the use of translucent glass panels within the walking path. 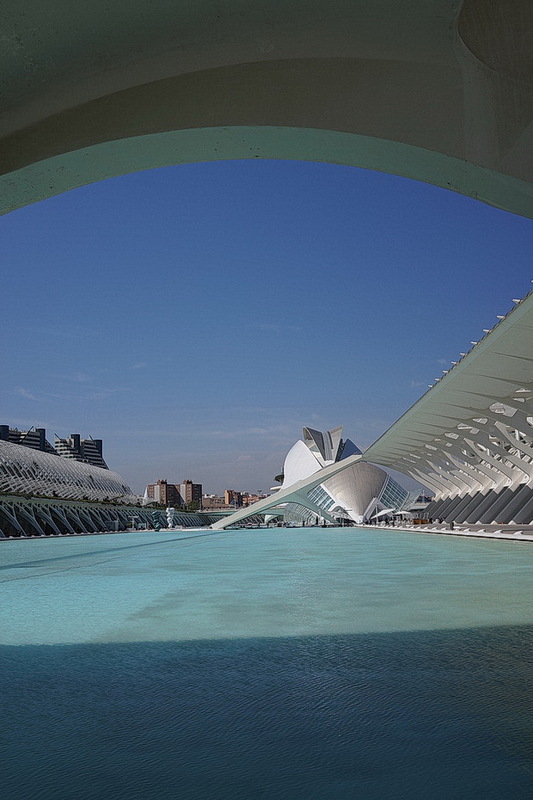 The transparent roof is supported by concrete arches that connect to the sunken gallery. There is a miraculous echo inside of the building and if two people stay on the two opposite pillars inside of the eye they can seamlessly speak with each other. 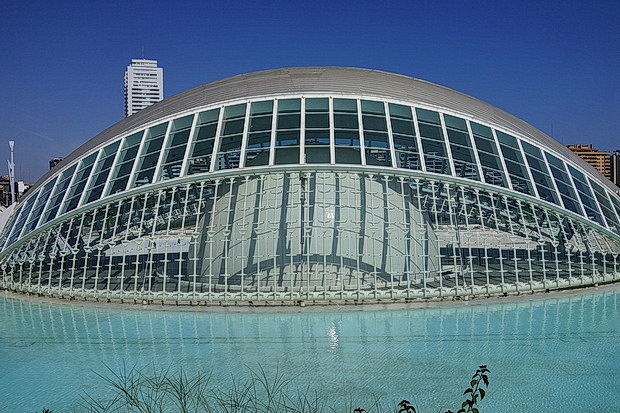 El Palau de les Arts Reina Sofia (2005) — an opera house and performing arts centre. 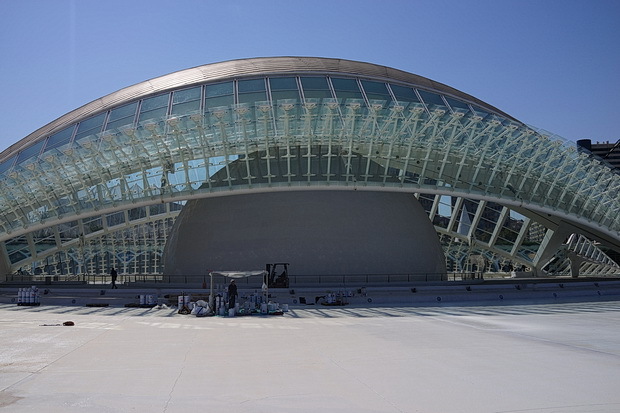 It contains four large rooms: a Main Room, Magisterial Classroom, Amphitheater and Theater of Camera. 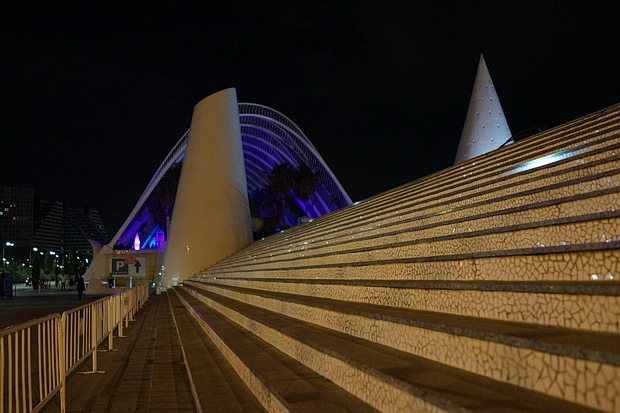 It is dedicated to music and the scenic arts. 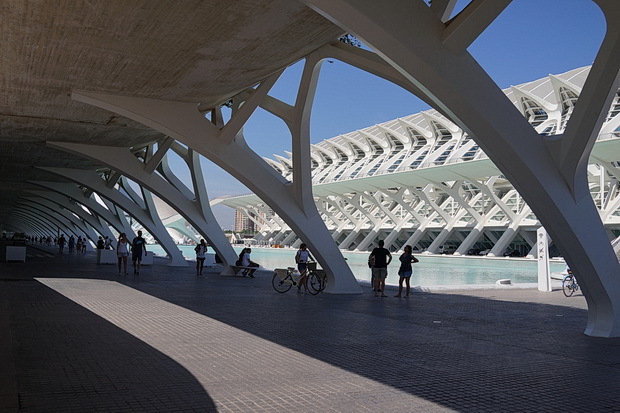 It is surrounded by 87,000 square meters of landscape and water, as well as 10,000 square meters of walking area. 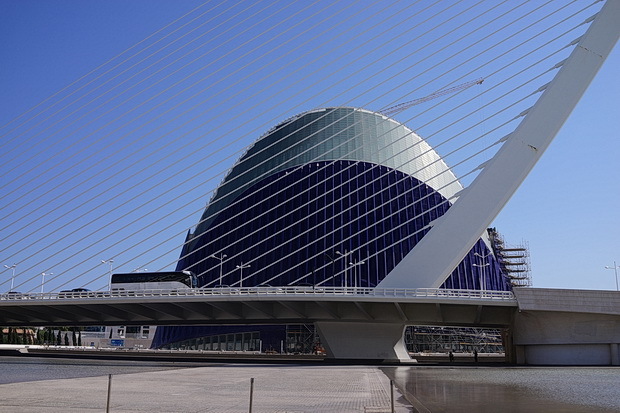 The Palau de Les Arts has four sections; the main hall, the master hall, the auditorium, and the Martin y Soler theatre. 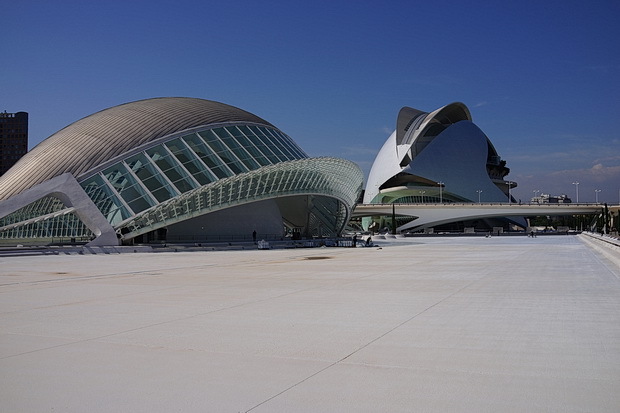 It holds many events such as opera, theatre and music in its auditoriums. 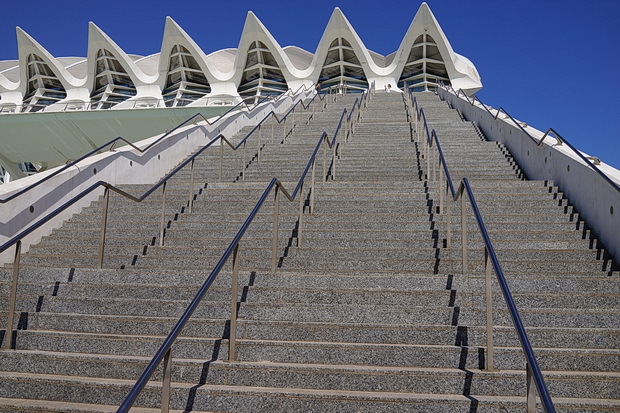 Panoramic lifts and stairways connect platforms at different heights on the inside of the metallic frames of the building. 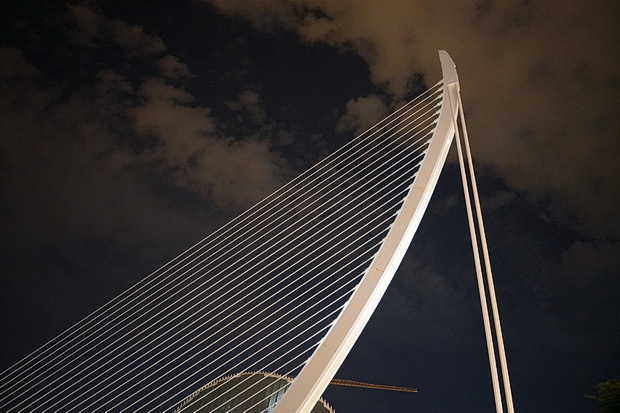 The building has a metallic feather outer roof that rests on two supports and is 230 meters long and 70 meters high. 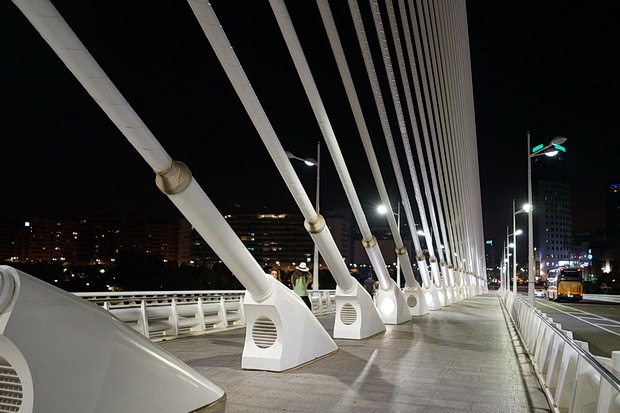 One of the supports allows for part of the building to overhang. 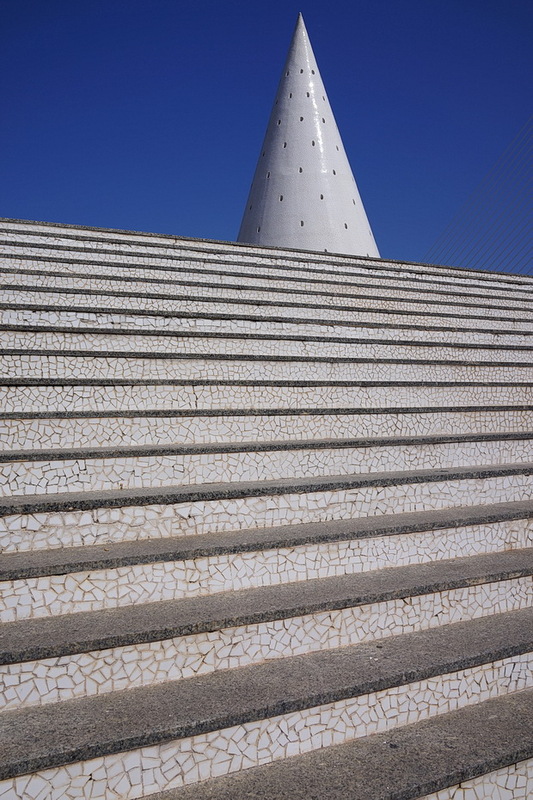 The building is supported by white concrete. 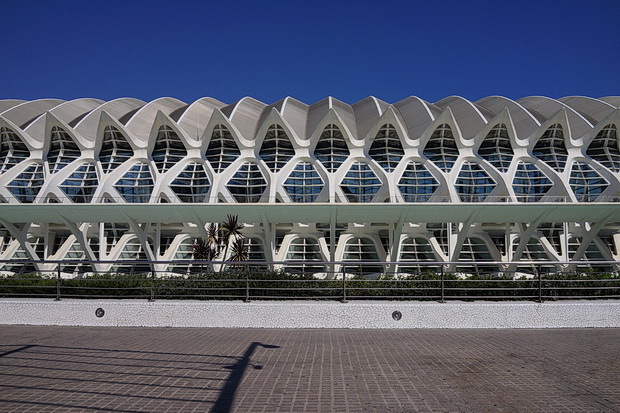 Two laminated steel shells cover the building weighing over 3,000 tons. 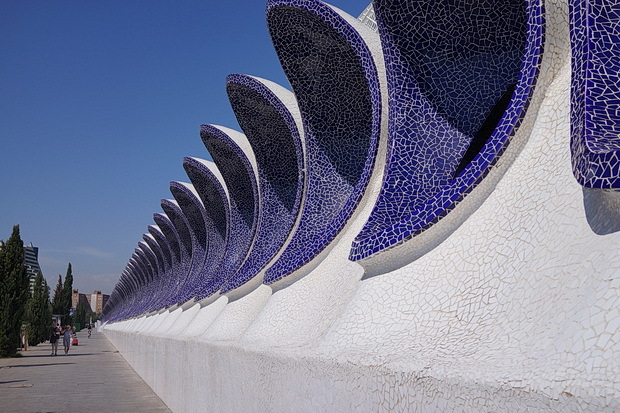 These shells are 163 meters wide and 163 meters long. 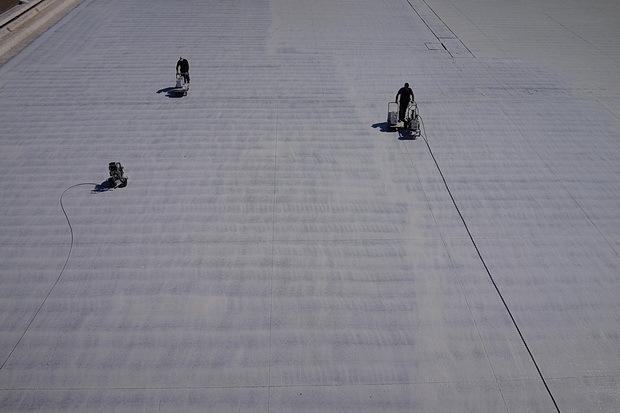 Workmen paint the drained lake. 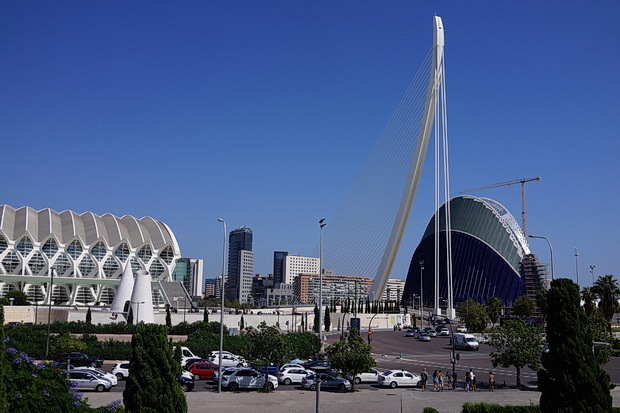 El Pont de l’Assut de l’Or (2008) — a white cable-stayed bridge crossing the dry Turia riverbed, connecting the south side with Minorca Street, in between El Museu de les Ciències and L’Agora. 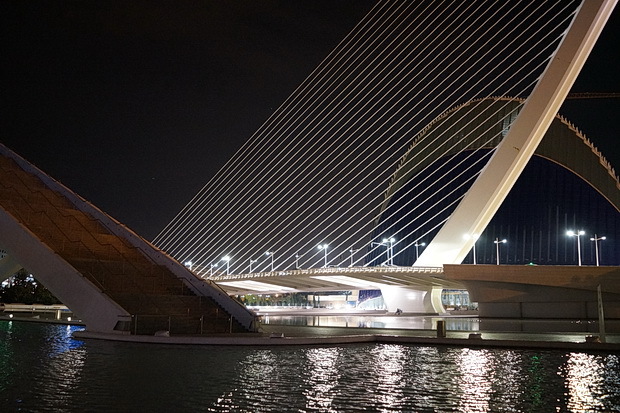 The tower of the bridge at 125 meters high is the highest point in the city. 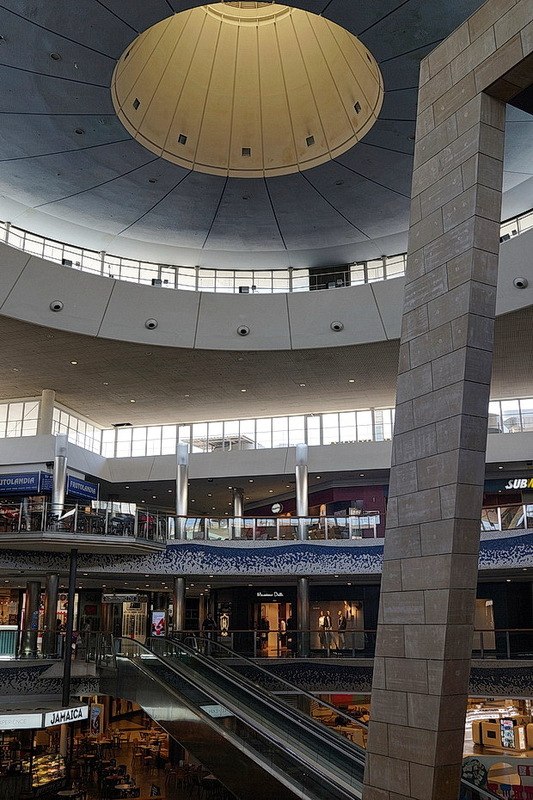 Not part of the City complex but located opposite is the modernistic El Saler Centro Comercial shopping mall, sporting an impressive ceiling dome.